VANCOUVER — Tyler Black got his nickname back in the first grade. By the time he was a freshman in high school, though, it was taken away by his defensive line coach. Tyler Black is Mad Dog once again, but it took some time. “It definitely motivated me to keep improving,” Black said. The 2018 Freedom Bowl Classic is Saturday at McKenzie Stadium. The main event is the high school game, featuring recent graduates from Southwest Washington. That game starts at 7:30 p.m. Earlier in the day, there will be two all-star games featuring Clark County Youth Football programs. Those are at 2 p.m. and 4 p.m. The game, which raises funds for Shriners Hospitals for Children, started in 2003. Since then, this game has raised more than $90,000. The website has a roster. Please note, not everyone on the roster will be playing Saturday. Some had scheduling conflicts. As a sophomore, Black had what he described as a “very, very good” JV game. “He started calling me ‘Mad Dog’ again,” Black recalled. At the time, Black was a student-athlete at Evergreen High School. His defensive line coach was Joon Apulu. Black would move to Mountain View for his final two years of high school, and Apulu is now on the staff at Union. This week, though, they are back together, hoping to help the East team prevail in the Freedom Bowl Classic. The game, which is Saturday night at McKenzie Stadium, features recent graduates from Southwest Washington and raises funds for Shriners Hospitals for Children. For Black, it just might be the last organized football game of his life. He is leaving his options open and would love an opportunity to play small college football, but for now his plan is to attend Clark College. No matter his future in the game, he is thrilled to be leaving high school football with the coach he admired so much when he entered high school football. Apulu is the head coach for East squad. “I missed having him as a coach. He was probably the best coach I ever had,” Black said. Apulu said Black was one of the bright spots on defense when the team got together for its first practice earlier this week. Black said he feels blessed to be playing in this all-star game because he has come so far from his freshman season. Now he is excelling with some of the top players in the region. Both squads will get to try to prove their worth on the field Saturday in what will be the 16th Freedom Bowl Classic. As in a W — a win. In many ways, his whole career has been a win. At Mountain View, he was part of back-to-back Class 3A Greater St. Helens League championships. Plus, he got to play a sport he truly loves. And on Friday nights, he was under the lights with the Thunder. Oh yes, the home games for Mountain View are played at McKenzie Stadium. “I’m just going to feel really blessed, just to be able to play one more time,” he said, knowing he will be wearing that Thunder helmet Saturday night. Tyler Black will represent his school and his family, and by doing the best he can, he will be giving a salute to an inspirational coach who knew just how to motivate him. 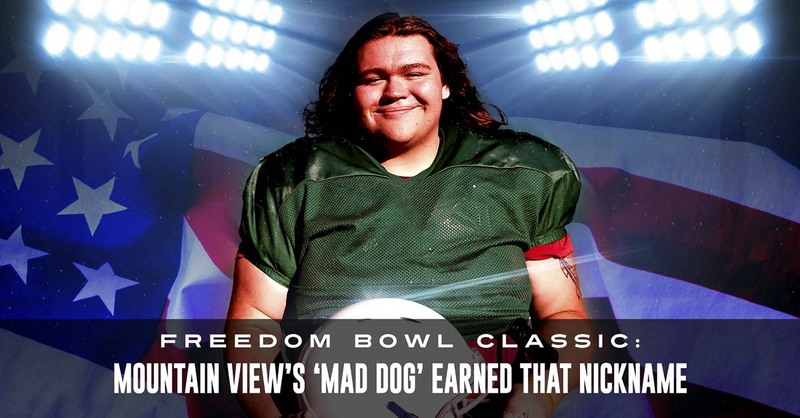 And Tyler Black will walk away from high school football as Mad Dog.